AutoPlus is a companion application for AutoPlus Deluxe Window Sticker Software for pc computers. This app includes a VIN scanner to speed data entry on iPhone 3GS and newer. 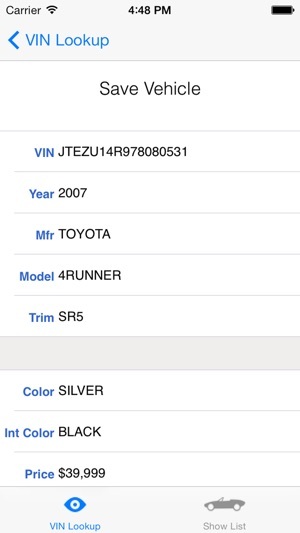 The VIN may also be entered by keypad for non-camera equipped devices or when the VIN barcode is inaccessible. AutoPlus quickly authenticates and then decodes the VIN (serial number) and displays rich details including year, make, model, engine, equipment and optional accessory items and retrieves EPA city and highway mileage values. Data can be collected for any number of vehicles and then uploaded to the AutoPlus servers where it can be automatically downloaded into the AutoPlus Deluxe Window Sticker Software where photos can be linked, data can be edited, window sticker labels and FTC Buyers Guide labels can be printed, and data and photos can be distributed to various web services and shared with other applications. AutoPlus accepts vehicles produced after 1981 (17 digit VINs). Data coverage is for North American vehicles and omits data for exotic vehicles and older vehicles that are not commonly found on dealership car lots. A new, more efficient server has been added to make your data uploads even faster and this update is required to continue uploading data using this app. Our new server operation also makes future improvements to this app's efficiency easier to implement. We have updated this app for iOS 12. I use this app and this company's software to perform my job on a full time basis. I have used this app since its release. 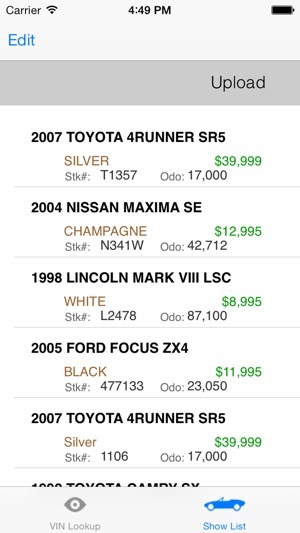 This application makes my job of updating dealership inventories so much more efficient! So easy to use! I have the convenience of carrying all I need for the day in my pocket! This company also provides outstanding customer service!!! I highly recommend any product by this company because I have never been disappointed in over 6 years of doing business! 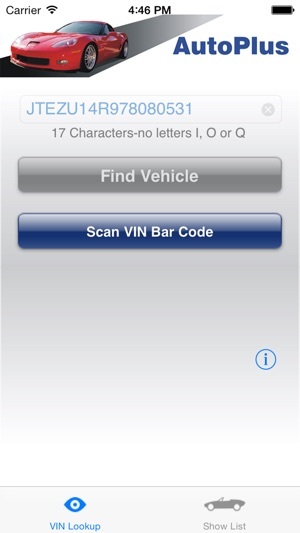 I purchased this app For scanning and storing VINs on vehicles that I repair as I am a master certified technician. Unfortunately this app is only intended for the elite world of car dealers that can afford the high price of expensive software. This app will not store VINs and let you reopen them later as I was duped into thinking. It only stores VINs so you can upload them to a PC and then to the developers server so they can make you a window sticker. It is a shame none of these developers can make an app for the professional technician for storing and decoding a VIN number. I wasted $9.99 and the app store needs to get a return policy in place. Several of our people use it to enter inventory for our Internet manager. It's really easy to scan the VIN bar codes. Otherwise you can just type them in. I have used it to confirm trade details. Great support when I called. I am extremely satisfied.